Open Space Gallery, a collective in Halle (Saale), Germany, turned the marginalized neighborhood of Freiimfelde into an open-air street-art gallery by painting the façades of vacant houses, improving the area’s image—and, unintentionally, also its marketability. Nina Gribat examines how, following invitations by policymakers to participate in other projects, they have managed to walk the line between grassroots and mainstream action. Open Space Gallery (OSG; Freiraumgalerie in German) is a group of young people who have organized façade-painting events in Freiimfelde, an area with lots of vacant housing in Halle (Saale), in Germany. Since turning Freiimfelde into an open-air graffiti gallery, OSG has become involved in other processes and projects to regenerate this marginalized area. In this article, I examine OSG’s work in relation to the sometimes ambivalent assessment of creative grassroots urban development in a context of urban decline. My discussion shows how OSG in Halle has negotiated the tensions between alternative development and co‑optation into mainstream creative-city discourses and policies. Creative-city approaches have been widely considered as promising forms of postindustrial urban development (Landry and Bianchini 1995; Florida 2003). In contrast to classic Keynesian structural policies that aim to ameliorate uneven spatial development on a larger scale through state investment in infrastructure and services and fiscal redistribution, creative-city policies work on an urban or regional level. They are “designed to stimulate ‘creative’ growth of city economies—usually by way of market-friendly intervention in the cultural sphere to attract or retain elite workers” (Peck 2011, p. 41). Such policy approaches are often critiqued for being complicit with processes of urban neoliberalism and a shift from managerial to entrepreneurial urban governance (Harvey 1989; Zukin 1995), which often results in processes of gentrification and social exclusion. In the context of urban decline in Germany, policies that promote development through culture and creativity have been on the rise in the last 20 years (Liebmann and Robischon 2003). In contrast to creative-city approaches that are based on larger urban cultural development projects requiring substantial funds (such as Bilbao), in the German context of urban decline and shrinking municipal budgets, temporary use and so-called “makeshift” approaches to development have played an important role (Oswalt 2005; Overmeyer and SenStadt Berlin 2007; Oswalt, Overmeyer, and Misselwitz 2013; Ferguson and SenStadt Berlin 2014). These often take the form of temporary appropriations of unused or underused land and buildings (Ziehl 2012). Different actors can initiate temporary interventions such as different state or quasi-state bodies and non-governmental or grassroots institutions or groups. Because of this involvement of wider sets of actors, temporary use and makeshift approaches are often associated with alternative, socially inclusive forms of urban development. However, despite the potentially different intentions of the initiators of such projects, there has been a tendency for city officials to incorporate temporary use and makeshift projects in the cultural sector into creative-city marketing policies and discourses (Colomb 2012). Temporary use and makeshift projects are even sometimes associated with processes of urban upgrading and gentrification. Berlin’s city marketing campaign “Be Berlin”, for instance, uses images of a range of makeshift urban projects to show how creative Berlin is, but there has been no substantial urban policy that supports such projects. Those involved in developing makeshift projects sometimes resist and struggle against instrumentalizations as part of urban social movements (Novy and Colomb 2013). The availability of space appears to be a precondition for negotiating the ambivalences of alternative forms of urban development and their exploitation within market logics: “If a notion of critical urban practice is to remain meaningful, then it seems important to defend the spaces in which it becomes possible, even if temporarily, and only ever imperfectly” (Tonkiss 2013, p. 323). In a context of urban decline, such spaces for experimentation appear to be abundant. As the following discussion shows, this assumption may be deceptive—at least in the long term. Halle (Saale)  is a city in East Germany—the former GDR—that has experienced long periods of urban decline following German reunification. Between 1990 and 2010, the city lost around 80,000 inhabitants—more than 25% of its population (Rink et al. 2011). Today, Halle is home to some 240,000 residents. Since German reunification, many areas of Halle have been designated for different urban policies. Freiimfelde is an old part of the city with largely Wilhelminian-style buildings, located east of the railway station and relatively close to the old city center (see map in Figure 1). However, the railway tracks isolate the area from other parts of the city. Furthermore, during GDR times, the area was also marginalized by the presence of a slaughterhouse. After reunification, it became known for prostitution, petty crime, and dereliction. In the early 2010s, Freiimfelde had the largest number of vacant housing buildings (von Busse 2011) and the highest vacancy rate—more than 60% of dwellings—in Halle. In contrast to many other areas in Halle with similar conditions (i.e. vacant housing, unemployment, below-average income levels), Freiimfelde was not designated for any of the policy programs set up by the German Länder (federal states) or the European Union to deal with urban decline (such as Stadtumbau, Soziale Stadt, or URBAN). Source: www.mapz.com; map data: OpenStreetMap OdbL. “For us, [the painted façades represent] a Utopia of the colorful city—the murals work as a setting, as a hook and mainly as a metaphor for a self-created residential and living environment in which different characters, preferences, needs and lifestyles become visible and where none is more or less valuable than another” (Freiraumgalerie Publishing 2015, p. 255; translation by the author). All photos © Nina Gribat. Despite emphasizing DIY culture and an equitable form of urban development, OSG has helped to change the image and thereby the marketability of Freiimfelde. This causes ambivalence for OSG members. On the one hand, they realize that others (may) make a profit on the basis of OSG’s voluntary non-profit actions, such as the owners of vacant buildings in the area that can now be rented or sold profitably. On the other, urban development processes such as an increase in the number of people moving to Freiimfelde than to other areas of Halle or the regeneration of formerly derelict houses are also signs of OSG’s success. OSG uses this success—which is also expressed by the city planners’ invitation to collaborate—for their own marketing. However, at the same time, the possibility of OSG’s approach falling victim to its own success (i.e. having to leave the area because there are no more spaces available) became conceivable. OSG therefore shifted its approach. After three years of organizing festivals, the group started working more permanently in the area of Freiimfelde—several members of the group had already moved to the area. They rented their own workshop/office space in an old industrial building and started setting up civic cultural education projects, offering such workshops as graffiti, painting, urban gardening, and beatboxing (Freiraumgalerie Publishing 2015). This also gives the group that had been working on a voluntary basis some income. In addition, OSG contributed to the formation of a civic initiative, Freiimfelde e.V., which aims to organize the permanent public reuse of a vacant open space in the area. In 2015, OSG were invited by urban policymakers in Halle to prepare a citizen-led neighborhood concept for the area. This is the first time that a neighborhood-based group was asked to carry out such a planning process in Halle, rather than an outside urban-planning agency. It shows that the city recognizes OSG’s engagement in the area. As part of preparing this concept, OSG has organized a public participation process to involve the whole neighborhood in the preparation of the concept. In the same year, OSG also started working on a long-term development vision for the neighborhood that secures and expands the existing supply of spaces for the creative and cultural economy, creating new community spaces, offering social services, and providing good conditions for small local businesses (such as a bakery and café). With this concept, OSG, in collaboration with other local actors and the city council, won a “starting grant for an equal-opportunity urban development” from the Montag Stiftung (“Monday Foundation”), a German non-profit organization. The grant focuses on projects in urban areas with difficult development prospects. It invests in real estate, with the aim of reinvesting profits into the communal redevelopment of the area. The real estate is managed by local actors (in this case, OSG) and based on cheap rental and lease agreements. As a result, “economic and social capital stays in the neighborhood” (Montag Stiftung Urbane Räume 2016). OSG’s project idea is based on stabilizing the start of a positive neighborhood development together with existing inhabitants, some of whom have lived in the area for many years, while seeking to prevent gentrification. “The communal use of vacant real estate together with a central open space shall become the core of an urban neighborhood development ‘from the bottom up’” (Montag Stiftung Urbane Räume 2016). OSG, together with the City of Halle (Saale), has applied for more EU funding to secure the implementation of the project. With this project, OSG emphasizes their engagement in favor of a self-determined Freiimfelde against real-estate speculation. The case of OSG shows how grassroots initiatives that experiment with unusual and temporary approaches—such as painting façades of vacant houses with graffiti—can become involved in urban development experiments that lead to longer-term engagement in neighborhood development processes. It highlights some of the possibilities for alternative urban development that may be opening up in a context of urban decline, which can—at times—also be incorporated into a mainstream creative-city script. Rather than avoiding such co‑optation altogether, the case of OSG highlights productive ways of exploiting it for its own needs. OSG has realized very quickly that it might soon become a victim of its own success (i.e. be displaced) and has thus focused on developing a strategy to secure their long-term involvement in the area while also opening up possibilities for development without gentrification. This in itself is an act of defending spaces for critical urban practice, but it also raises larger questions regarding opportunities for other similar groups in the future, who may no longer be able to find suitable spaces such as Freiimfelde in Halle, or indeed to benefit from the necessary willingness and support of city officials. Colomb, Claire. 2012. “Pushing the Urban Frontier: Temporary Uses of Space, City Marketing, and the Creative City Discourse in 2000s Berlin”, Journal of Urban Affairs, vol. 34, no. 2, pp. 131–152. Ferguson, Francesca and SenStadt Berlin. 2014. Make_Shift City: Die Neuverhandlung Des Urbanen, Berlin: Jovis. Florida, Richard. 2003. The Rise of the Creative Class: And How It’s Transforming Work, Leisure, Community, and Everyday Life, New York: Basic Books. Freiraumgalerie. 2015. Projektbericht Freiraumgalerie 2012–2014, Halle (Saale): Freiraumgalerie/Postkult e.V. Freiraumgalerie Publishing. 2015. Freiraumgalerie: Stadt Als Leinwand, Halle (Saale): Halle & Treihse & Hill GbR. Freiraumgalerie and Postkult e.V. [n.d.]. Interaktive Freiraumgalerie Halle Freiimfelde AYCP – Urban Art Festival: Ein interaktives Stadtgestaltungsprojekt zum innovativem Umgang mit Leerstand und urbaner Kunst in Halle Ost/Freiimfelde, Halle (Saale): Postkult e.V. Gribat, Nina; Langguth, Hannes; and Schulze, Mario. 2015. “‚Make-Shift-Urbanismus‘ in den Zeiten einer ‚Absoluten Gegenwart‘? Auf den Spuren städtischer Praktiken um das Ostkreuz in Berlin”, Sub\urban. Zeitschrift für kritische Stadtforschung, vol. 3, no. 3, pp. 111–124. Harvey, David. 1989. “From Managerialism to Entrepreneurialism: The Transformation in Urban Governance in Late Capitalism”, Geografiska Annaler. Series B, Human Geography, vol. 71, no. 1, “The Roots of Geographical Change: 1973 to the Present”, pp. 3–17. Landry, Charles and Bianchini, Franco. 1995. The Creative City, London: Demos/Comedia. Liebmann, Heike and Robischon, Tobias (eds.). 2003. Städtische Kreativität – Potenzial für den Stadtumbau, Erkner/Darmstadt: Institut für Regionalentwicklung und Strukturplanung e.V./Schader Stiftung. Montag Stiftung Urbane Räume. 2016. Quartiere Kooperativ Entwickeln: Initialkapital Für Eine Chancengerechte Stadtteilentwicklung, Bonn: Montag Stiftung Urbane Räume gAG. Novy, Johannes, and Colomb, Claire. 2013. “Struggling for the Right to the (Creative) City in Berlin and Hamburg: New Urban Social Movements, New ‘Spaces of Hope’?”, International Journal of Urban and Regional Research, vol. 37, no. 5, pp. 1816–1838. Oswalt, Philipp (ed.). 2005. Schrumpfende Städte. Band 2: Handlungskonzepte, Berlin: Hatje Cantz. Oswalt, Philipp; Overmeyer, Klaus; and Misselwitz, Philipp. 2013. Urban Catalyst: The Power of Temporary Use, Berlin: DOM Publishers. Overmeyer, Klaus and SenStadt Berlin (eds.). 2007. Urban Pioneers: Temporary Use and Urban Development in Berlin, Berlin: Jovis. Peck, Jamie. 2011. “Creative moments: working culture, through municipal socialism and neoliberal urbanism”, in E. McCann and K. Ward (eds. ), Mobile Urbanisms: Cities and Policymaking in the Global Age, Minneapolis: University of Minnesota Press, pp. 41–70. Rink, Dieter; Haase, Annegret; Bernt, Matthias; Arndt, Thomas; and Ludwig, Johanna. 2011. Urban Shrinkage in Halle, Germany, research report, Leipzig: Helmholtz Centre for Environmental Research – UFZ GmbH. Swyngedouw, Eric. 2013. “The Zero-Ground of Politics: Musings on the Post-Political City”, in T. Kaminer, M. Robles‑Dran and H. Sohn (eds. ), Urban Assymmetries: Studies and Projects on Neoliberal Urbanization, Rotterdam: Nai Publishers, pp. 22–33. Tonkiss, Fran. 2013. “Austerity Urbanism and the Makeshift City”, City, vol. 17, no. 3, pp. 312–324. von Busse, Hendryk. 2011. Spiel mit der Leere: situationistische Stadtvision am Beispiel von Urban Art zur partizipativen Stadtgestaltung, Fallstudie Halle (Saale), Diplomarbeit im Studiengang Raumplanung (thesis in spatial planning), Technische Universität Dortmund. Ziehl, Michael; Oßwald, Sarah; Hasemann, Oliver; and Schnier, Daniel (eds.). 2012. Second-Hand Spaces: Recycling Sites Undergoing Urban Transformation, Berlin: Jovis. Zukin, Sharon. 1995. The Cultures of Cities, Cambridge (Mass. )/Oxford: Blackwell. The city’s official name has been Halle (Saale) since 1995, but it was formerly known as Halle/Saale (1965–1995) and Halle an der Saale (“Halle-on-the-Saale”). 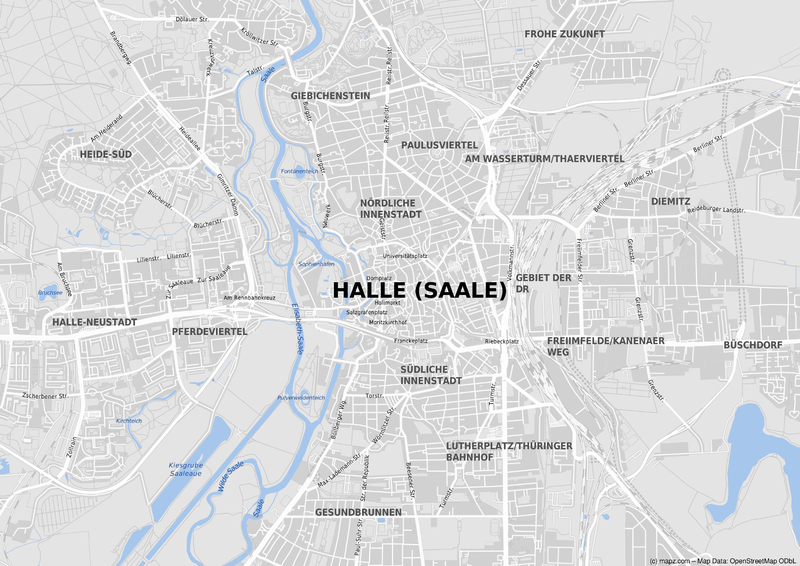 In all three cases, “Saale” is added to avoid confusion with the smaller town of Halle (Westfalen). Hereafter, we shall refer to the city simply as Halle.